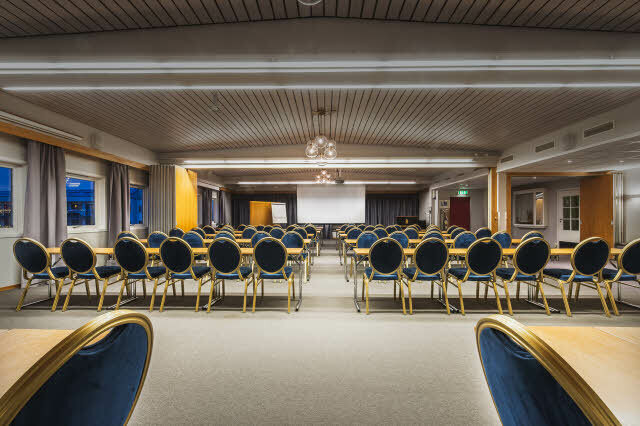 Hold your conferences in rooms conveniently located close to the E6 and by the city’s main street, yet with nature just round the corner for inspiration. Relax after a rewarding conference day and enjoy something delicious and locally produced to eat at Café 33. Our restaurant is open daily for breakfast. Lunch and dinner is served in Café 33, great food based on local ingredients. Here you can also enjoy a glass of wine, lighter snacks or a coffee and a pastry. We have 10 fully equipped meeting rooms in different sizes, where the biggest have a capacity for up to 150 participants. This is a great facility for evening events. For your convenience we offer free WiFi and free outdoor parking for our guests. The hotel is great for meetings and conferences. Our hotel is situated in the centre of Fauske, close to Skjerstadfjorden and only one hours drive from Bodo Airport. Situated in the Arctic circle this town offers you 24-hrs of daylight from May to August, and midnight sun from June to July. Famous for its glaciers, mountains, lakes, caves and nature reserves, this town has a lot of beautiful nature experiences to offer you. 10,000 is how many points you need for a reward night here. Every time you stay with us you earn points per qualifying night to use for a reward night at any hotel within Scandic.